Confused and bloody warfare have been the hallmark of the past five cycles. A second battle was fought between biological and cyber forces over a Nomad Platform controlled by minions of the Charon Empire. Phantatwain losses were in excess of a hundred starships. Cybernetic losses were undetermined but said to be considerable. Another set of platforms were discovered and assaulted by cybernetic and allied forces in the Kurta sector. Gorkhan VII carrier fleets supported main force operations with starfighter sweeps in adjacent regions of space coupled with point blank sorties into hostile planetary orbits. Three platforms of the Grand Alliance were lost while the original target of the Phantatwain escaped capture. Other colonies and outposts were invaded and captured on both sides. At least one world suffered total liquidation of the populace. In other news, alliances within the surviving biologicals were jeopardized by recent events involving Mutos of Rhatsibahn, Apshain Federation, and the Raths, descendants of the great Seth Naf Gar. It seems that Mutos Rhat smugglers set up a smuggling operation on a Rath world without informing the Raths. When the local Rath government began to report incidents by guerrilla units in the planet’s hinterland, Imperial advisers were sent to survey and evaluate the threat. To their dismay, over 400 guerrilla units were detected on the world. Protests were sent to Mutos diplomats but no adequate explanation was forthcoming. In a separate event, Apshain forces were mauled by Mutos forces who apparently knew little or nothing about the alliance agreement between the Apshain and Mutos. After a vigorous protest by the Apshain, a Mutos communique was sent, admitting that the alliance treaty agreed to so long ago had never been formally rhatified by the Mutos assemby. Rhat diplomats subsequently offered reparations payments over a five year period and promised immediate action to rhatify the alliance treaty. 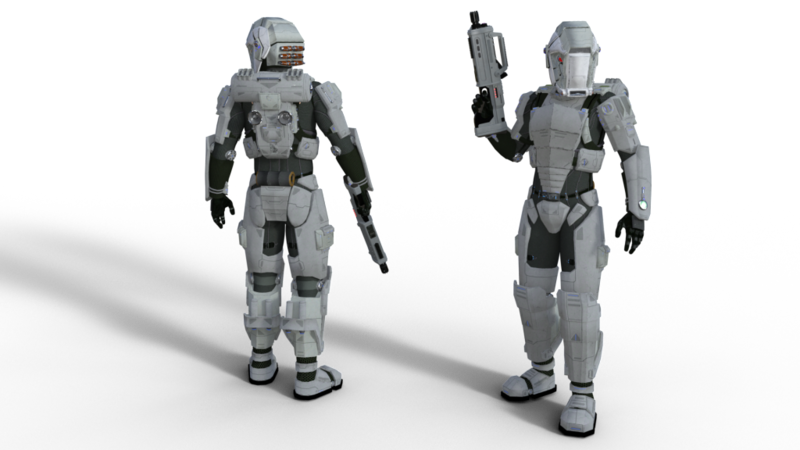 Orbital Jump Trooper in full combat kit.